Sorry, but Exhibition on Screen: Canaletto and the Art of Venice is either started or over at National Gallery of Ireland. No artist better captures the essence and allure of Venice than Giovanni Antonio Canal, better known as Canaletto. Despite Canaletto’s close relationship with the city in which he lived and died, the world’s largest collection of his works resides not in his native Italy, but in Britain as part of the Royal Collection. In 1762, George III purchased almost the entire collection amassed by Joseph Smith, British Consul in Venice and Canaletto’s principal agent. This unique film grants access to the Royal Collection’s exceptional holdings of Canaletto's work, much of which is on display as part of the exhibition Canaletto & the Art of Venice at The Queen’s Gallery (19 May - 12 November). The remarkable group of over 200 paintings, drawings and prints on display offer unparalleled insight into the artistry of Canaletto and his contemporaries, and the city he became a master at capturing. The film also offers the chance to step inside two official royal residences - Buckingham Palace and Windsor Castle - to learn more about the artist, and Joseph Smith, the man who introduced Canaletto to Britain. 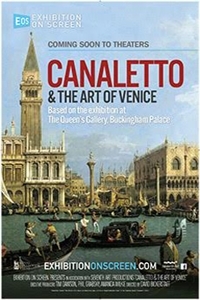 From London, Canaletto & the Art of Venice travels to the great Italian city to explore the origins of Canaletto’s art, visiting the sites immortalised in Canaletto’s views - from the Rialto Bridge to the Piazza San Marco, and the Palazzo Ducale to the Church of Santi Giovanni e Paolo. Whilst appearing to be faithful representations of the city, Canaletto's skill came from his manipulation of reality. He moved buildings around or opened up vistas to create the perfect composition, and his paintings of Venice were highly sought after by Grand Tourists. His playful imagination extended into a new genre in which he excelled. The 'capriccio' combined real and fantasy architecture into imagined views. In this sense, Canaletto is more than a topographical artist - he is a master storyteller. Guided by Royal Collection Trust curators and the world’s leading experts in Venetian history, the film is not only a wonderful way to see the exhibition, but an opportunity to get closer to Canaletto and the city that inspired him.